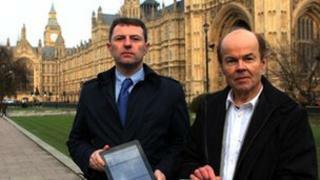 The press have been urged to take action over Leveson Inquiry recommendations to regulate the newspaper industry. Lord Justice Leveson called for a new independent watchdog - which he said should be underpinned by legislation. Culture Secretary Maria Miller told the BBC "the gauntlet has been thrown down" to newspapers to outline how they would set up tough self-regulation instead. A campaign has been launched calling on MPs to implement the proposals in full. Leveson Inquiry witnesses Gerry McCann, the father of missing Madeleine McCann, and Christopher Jeffries, who was wrongly arrested for the murder of Joanna Yeates, launched the petition which is on the campaign group Hacked Off's website. Lord Justice Leveson's 2,000-page report into press ethics, published on Thursday, found that press behaviour was "outrageous" and "wreaked havoc with the lives of innocent people". He said the press - having failed to regulate itself in the past - must create a new and tough regulator but it had to be backed by legislation to ensure it was effective. The report exposed divisions in the coalition government, with Prime Minister David Cameron opposing statutory control, unlike his deputy Nick Clegg, who wants a new law introduced without delay. Following cross-party talks on Thursday night - which will resume next week - the Department for Culture, Media and Sport will begin the process of drawing up a draft bill implementing the Leveson recommendations. It is thought the draft legislation may be ready within a fortnight. The prime minister believes this process will only serve to highlight how difficult it is to try to legislate in a complex and controversial area while Labour and the Lib Dems think it will demonstrate the opposite. But the BBC's Norman Smith says Labour sources fear the government will produce draft legislation written in such a way as to discredit the proposals - "like something the Stasi [East German secret police] had written". Speaking on BBC Breakfast, Mrs Miller said: "Our concern is that we simply don't need to have that legislation to achieve the end of objectives and in drafting out this piece of legislation what we are going to be demonstrating is that it wouldn't be a simple two-clause bill." She said Conservative ministers felt that legislation "would actually give the opportunity in the future to bring into question the ability of Parliament to stay out of the issue of free press and difficult for Parliament to not have a statutory framework on which they could hang further bits of legislation". She went on: "At this point what we should be focusing in on is the fact that the gauntlet has been thrown down to the industry. Government sources say they expect to produce a draft "Leveson" bill within a fortnight. However they expect the draft bill to underline their argument that any legislation would be much more unwieldy and extensive than envisaged by supporters of Leveson. They believe the draft bill will support their view that legislation would therefore be a threat to the freedom of the press. Instead, ministers want the newspaper industry to come forward with their own plans for regulation "within months." It's also being made clear that if the industry fails to agree on an acceptable revised package..then "the legislative stick remains an option." Earlier, Culture Secretary Maria Miller said alongside the issue of legislation, she had "very grave concerns" about some of the other details in the Leveson report -including on the role of Ofcom and rules on data protection. "The press industry need to be coming back with their response to the Leveson report. Their response to how they're going to put in place a self-regulatory body that adheres to the Leveson principles and that is what I want to see moving forward swiftly." Many of Friday's newspapers have praised Mr Cameron's opposition to law-backed regulation. But Guardian editor Alan Rusbridger told the BBC "a bit of statute" was a price worth paying for an effective new system of regulation and that he believed the press could "live with most of" the Leveson proposals. Mr Rusbridger, who revealed that he spoke to other editors on Thursday night, said: "I think about 80% of it is right and can be agreed on. "It is right that is is open, that it is fair, that it's got sanctions, that it can investigate... that it's not picked from amongst the old cosy club." But the father of Madeleine McCann - the young girl who went missing in Portugal in 2007 - said he would have liked the report to have gone further. "Clearly the public want it, there's been a judicial review and I think the recommendations should be implemented. "There's no good reason why they shouldn't be. That's my view and I think it's the view of all the victims," he said. Mr McCann, who was the subject of what he called "unbelievably damaging" newspaper reports that suggested he and his wife killed Madeleine, added: "The press has been given enough chances, and in my opinion Lord [Justice] Leveson has given them another chance to put a structure in place which they are happy with." Labour leader Ed Miliband has joined Mr Clegg in supporting a new press law. He said many of the victims of sections of the press will be feeling "utterly betrayed" by the prime minister. "I am going to stand up for people like the McCanns and the Dowlers who have been appallingly treated by sections of the press and who put their faith in David Cameron, put their faith in the Leveson Inquiry, and who are frankly I think astonished by what the prime minister has done," he said. Mrs Miller is meeting members of the Hacked Off campaign on Friday afternoon and will discuss the position taken by Conservative ministers.